How to Get More Subscribers on Youtube ? Home how to youtube How to Get More Subscribers on Youtube ? Subscribers for YouTube is a main factor to growing as popular on the Internet. If you want to grow up your business on YouTube then subscribers takes the viral part to make you succeed. At present YouTube is the video content leading platform for blogging and marketing. After YouTube there have Twitter and Facebook to marketing targeted regions customers. But currently YouTube takes the first place to grow your business quickly. So, in this platform to be successful you must have to know how to get more subscribers on youtube. Today you will know lots of smart free ways to increase subscribers of your Youtube channel. Many people have their own channel and they are trying to increasing there subscribers by Buying Subscribers from different websites. But I want to say, that's not a good way to go. Buying subscribers will not lead for targeting traffics. Because, that buying subscribers may not interested about your video, product or about your business. And if you get real subscribers then that will be the power to grow your traffic faster than anything else. 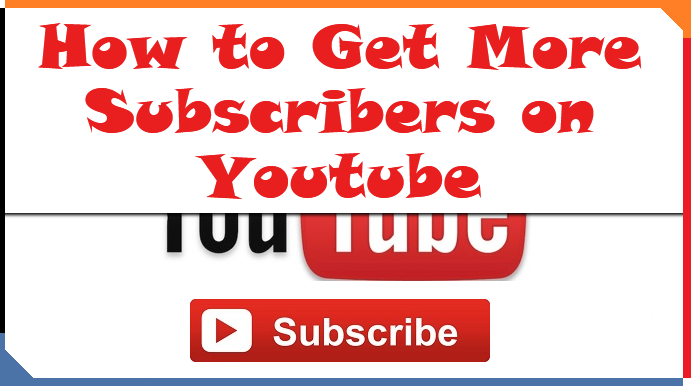 Bellow I have described all smart ways to get more subscribers on youtube. You should work for increasing videos views which will let you get the real subscribers. Because there you will get all good subscribers who is really interested about your video. That makes the great part of your channel. There have lots of good way to increasing views on your youtube. I have described about the increasing views on a post you can read how to get more views on youtube. I think this article will help you a lot. Views helps to get subscribers for real. And always ask after the finish of your video to subscribe your channel which will help them to remember for subscribe. Now most of the popular You Tubers use lot of tools to optimization for getting views and subscribers. All tools are not good but you can take a right tool for you. There have a most trusted tools name Tube buddy. At present more than 150,000 You Tubers trust Tube buddy to optimize and to get views and subscribers. I recommend to use it for all new and old you tubers who really want to grow up their business. TubeBuddy is a free browser extension that integrates directly into YouTube to help you run your channel with ease. First step of getting started your YouTube journey should be planning about your channel what can be going on all about channel & structure of videos. Think that what type video you love to create and keep focus on related things to develop. Sham trend of youtube channel is totally wrong step to go. Start with what you like most that's very important to be successful on YouTube. Try to do something unique which will let you blast viewers and subscribers of your channel world wide. Show more details in your videos to make understand and interested to the viewers. Use English language for targeting viewers for your videos. Create all videos by doing plan before to make it interesting to the people. This is the most difficult things to do for a content creator. If you look around the YouTube you can be think that every video has been created under the sun and that looks most likely true. But here you can put own spin on popular topic. Example: there have many “unboxing” technologies videos. Now if you create a “reboxing” & talk about various components of technologies while put it back in box. Then here the key is creativity and for sure it will boost subscriptions. Annotations is a most important thing if you use it wisely. This is also an annoying thing lots of annotations pop up during the videos. But those can be good for your channel if you use it perfectly. You can add annotation to every video to make it easy by using link for them which will let them to subscribe. Once you will see subscription rate is increasing and continue to add it to every video. You should increase the Frequency of video uploading. It is easy to say than doing, but no one can ignore. Main reason is someone hit the subscribe button which is because they admire works of publisher & love to hear more often. All YouTube subscribers usually don't like channels and not regular. Most of them like to check new uploaded videos and most them never check, although its useful. But consistency is the real key to develop a long relationship with existing subscribers. If they are not going to check for new upload that doesn't matter they will always see all new uploaded videos on their home page. That will boost up your views. Frequency of Uploading helps to get more subscriber for long time. If you want to get visitors to trust your channel as a brand then you should use the most of the customization option that has to offer on YouTube. Being visually for appealing in sense that can establish your brands identity which is a great way to be a professional. Use good tools from online to customize your channel which will looks good and will attract the other to subscribe your channel. Every popular channel use their own trailer. You should carefully make a channel trailer for your channel which will help you to improve to get new visitors and subscribers. YouYube offers this great feature of channel trailer that will automatically play while a viewer visits your channel URL. Don't make the trailer longer than 1 or 1.5 min. On the trailer you have to show and tell about your channel why they should visit, what is all about your channel and what type useful video you have made for them. If you make the trailer too much longer than that can be the cause of bad result of subscribers and views of your channel. This is another part of getting new subscriber from other site by marketing. You have to share your videos to all social sites to get new views so that new users can come in your channel. As I mentioned before using annotations for Subscribe Button or Link and in the video tell them to subscribe your channel. Which is more powerful way to get new subscribers. Keep going on by following instructions and always upload new videos to catch the Subscribers and views continuously. If you don't upload new videos for long time then it can stop new subscribe to your channel and will get low visitors on youtube videos. You can share your channel and video on your personal blog or website. If you have one then take help from your friends who have one. This will help you to do marketing of your channel. I hope my article will be helpful for your new business which you want to getting start on youtube. This is the time to be successful online without giving any cost by marketing on youtube. You can be the most popular You Tubers worldwide if you work hard and go within a good effective way. Thanks for stay on my site and leave a comment if you need any help about YouTube. Don't forget to share with your friends because it can be helpful for others also.